While animals use all their sensory organs to a greater degree than humans, their eyes are just as important to them as ours are to us. Dogs, for example, can see three times better in low lighting than we can. This visual acuity not only keeps your pet safe but also can be reassuring when you're home alone or outdoors at night. It can even save lives during a search and rescue operation. 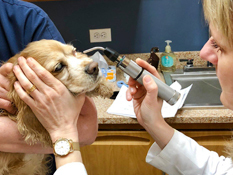 Staffed by a board-certified veterinary ophthalmologist - a specialist in animal eye care - the Ophthalmology service at NorthStar VETS offers comprehensive diagnostic resources along with medical and surgical treatments for ocular (eye) diseases. 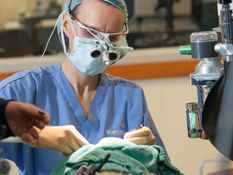 We see a wide variety of companion-animal patients, including dogs, cats, pocket pets, birds and horses. Simply call us at 609.259.8300. Pet Parents: Contact Jamie White at 609-259-8300 x1204 or at jwhite@northstarvets.com to schedule your appointment and get all pre-consultation paperwork set up. 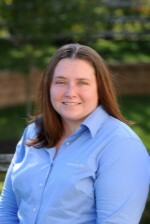 Veterinarians: Contact Jamie with questions about in-hospital cases, or to discuss a pending case. You can also refer a case online. Copyright ©2019 NorthStar VETS. All Rights Reserved.